High-precision air quality monitors are normally very expensive, but Tim Dye of Sonoma Technology is on a mission to change that. He’s been working with Michael Heimbinder and habitatmap.org to create a low-cost sensor system that when designed properly and integrated into a software platforms can provide valid data. 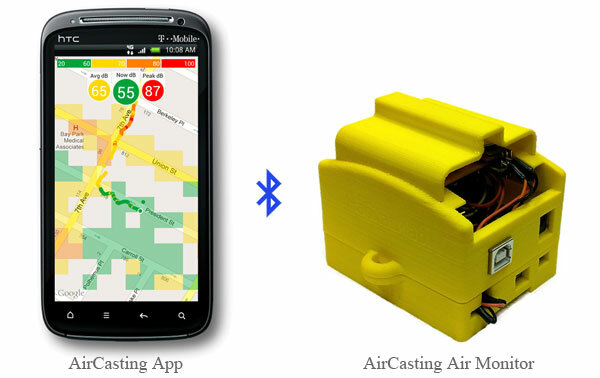 AirCasting is a platform for recording, mapping, and sharing health and environmental data using Arduino and Android. It combines an Arduino with a set of sensors for air quality measurement; temperature, humidity, and carbon monoxide, nitrogen dioxide, and particulate matter. The system combines the sensors using an Arduino Uno and then sends the data to an Android app using Bluetooth. The plans are all open for modification, so you can add your own sensors as needed. A heart rate monitor and an LED vest can also be linked to the AirCasting app, providing a complete the system for realtime, wearable feedback of your body’s reaction to the environmental air quality. There are many DIY air quality measurement projects online, but most of them are not calibrated against known standards or professional equipment. But Dye and his colleagues have tested the AirCasting particulate matter sensors against the same equipment Sonoma Technology uses for precise measurement, and they’ve gotten surprisingly good results. Correctly constructed and deployed, the AirCasting shows promise as a low-cost alternative to complement the expensive high-end air monitors. AirCasting is a collaboration between many groups: Michael Heimbinder of habitatmap.org manages the project, and Tim Dye of Sonoma Technology consults on design, data evaluation, and field deployment; Dr. Iem Heng and Raymond Yap of the City Tech Mechatronics Technology Center designed and built the hardware; Dr. Andy Zhang designed and built the monitor casings; Valentine Leung designed and built the LED garments, and Brooke Singer has helped guided the project with a mind towards interactivity and public engagement. The website AirCasting.org provides links to all the software and hardware plans. Bad link on the habitatmap.org link. Hi there, I found your web site by the use of Google at the same time as looking for a related subject, your web site came up, it appears great. I’ve added to favourites|added to my bookmarks. Highly interesting and informative to me. I love the work you are doing. putting the other person off. All that energy is boxed in, amplified by the space. I believe that you simply could do with a few % to drive the message home a bit, but instead of that, that is magnificent blog. You recognize thus significantly when it comes to this topic, made me for my part believe it from so many numerous angles. Its like men and women don’t seem to be involved except it is one thing to do with Woman gaga! Your own stuffs excellent. At all times maintain it up! Hello there, I discovered your site by means of Google at the same time as looking for a similar matter, your site came up, it appears good. I have bookmarked to my favourites|added to bookmarks. Hi to every one, because I am truly eager of reading this webpage’s post to be updated on a regular basis. It consists of nice stuff.